30" water cooled divided blast cupola with volume meters and pressure gauges having melting capacity of 6000 to 7000 Kg per hour. This cupola is fitted with wet scrubber for controlling pollution and slag granulation tank. Skip Hoist for above cupola--- 1 no. Portable Temperature indicators--- 2 nos. Online Electronic Carbon Silicon Analyzer --- 1 no. Metal crane weighing scale---1 no. 750 Kg --- 2 nos. Moulding bays with Heavy material handling facility 3 nos coverings about 6000 Sq. Feet. Electric Hoists 5 ton capacity --- 6 nos. 2 ton/hour Automatic sand mixer --- 2 nos. 6 ton/hour Automatic sand mixer --- 1 nos. Moulding boxes of various sizes listed below about 600 nos in 40 different sizes. The height is adjustable up to 2000mm. Smallest box size --- 300m*300mm. We use two part Nobake or Silicate-CO2 process for large cores. For smaller cores required in volume we use oil sand process. To carry out core making activity we have a separate core shop of @ 1500square feet. We have seven skilled people in the core shop. We have following equipment in the core shop. Core sand mixer capacity 100 Kg ---- 1no. Automatic Core sand mixer capacity 6 ton/hour -----1 no. Electric Hoist ----5 ton capacity 1 no. 30Kg electronic weighing scale for weighing chemicals --- 1no. 24" (600mm) swing frame grinder --- 1 no. 9" (230 mm) angle grinders - 12 nos. 16" (400mm) Pedestal grinder --- 1 no. Screw Compressor --- 1 no. Electronic Crane weighing scale of 3 & 5 ton capacity with remote display---1 each. 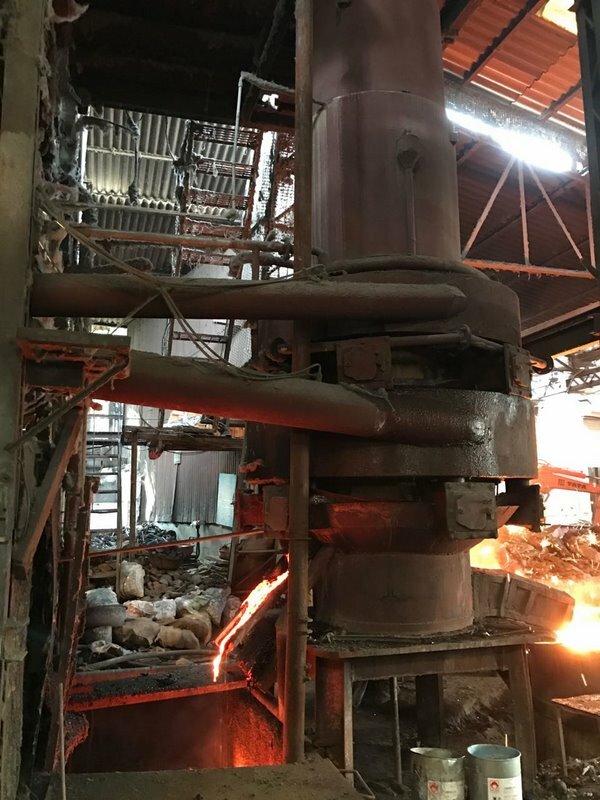 To make our foundry evenviromently friendly we try to minimize energy consumption & also reclaim sand. Vibratory sand reclamaition unit 6 ton/hour capacity - 1 nos. We have in house pattern inspection facility. We have tie ups with external pattern making houses. We are geared for proof and finish machining of heavy castings. We are equipped with CNC-VMC machines. Vertical Machining Centre (Awea - Taiwan) having Travels X - 3000mm, Y - 1600mm, Z - 1200mm and table load capacity 6 tons. Vertical Machining Centre (Kao-Ming - Taiwan) having Travels X - 1500mm, Y - 850mm, Z - 700mm and table load capacity 3 tons. Radial Drilling Machine---Capacity 25 mm.